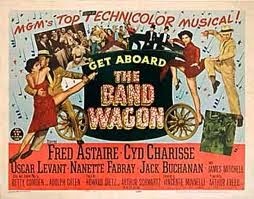 Band wagon: Wagon which carries musicians in a parade, for promotional purposes, esp. associated with the circus or political rallies. Also assoc. with sports fans who support a team only during times of success. Yep, after much demurring, dismissing and attempted debunking… I am finally jumping on the spring trend bandwagon. For a few things at least. I’m not going to the circus, not joining a political campaign, or painting my face to watch the Habs games…. I’m shopping for pastels…and gulp…abandoning my skinny jeans. Okay, maybe I’m not abandoning them, but our relationship is no longer exclusive. I’m not normally a fan of pastels. I find them too insipid, too soft… evoking little girls or old ladies. That soft, pastel pink makes my freckles and rosacea stand out starkly, as if I’m ill….or pale with shock. I’m not the only one who shudders at the thought of pastels. But even Alyson, who writes my favourite blog That’s Not My Age and who is an avowed pastel-hater, is looking lovingly at a pale yellow coat this season.You can read about that here. Okay, so, maybe if it doesn’t HAVE to be pale pink….I miiiiight just have another look at pastels. Maybe. Maybe a pale green would be better with my red head’s colouring and freckles? A lovely, sea green? And if I don’t have to invest too much cash? Enough demurring! I eventually ordered this pastel, green tee shirt from Gap on-line. Thinking that if I didn’t like the colour… at $12.00 (on sale) I could always wear it camping. But I love it! Love it so much! I think it looks great with jeans and with this blue scarf and these green earrings that a friend gave me for Christmas several years ago. Could I possibly have been wrong about other trends? Maybe too dismissive? 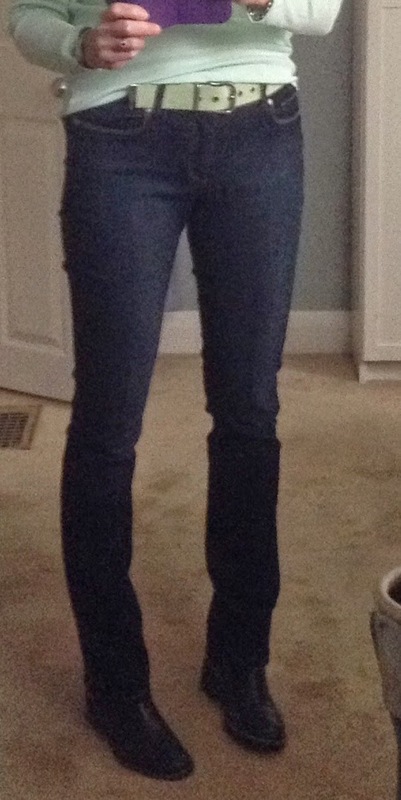 I’ve been wearing and loving my skinny jeans for a few years now. I knew it was a love affair that couldn’t last forever and, sure enough, the wider leg as opposed to a skinny one seems the new silhouette this season. I do NOT like the so-called boyfriend jeans. Their loose fit looks sloppy on me, and they’re better on someone who has a small waist, or a waist at all! But a more flared jean is something I might consider. Christine at My Style Pill does the flared jean best, I think. You can see her take on the trend here. 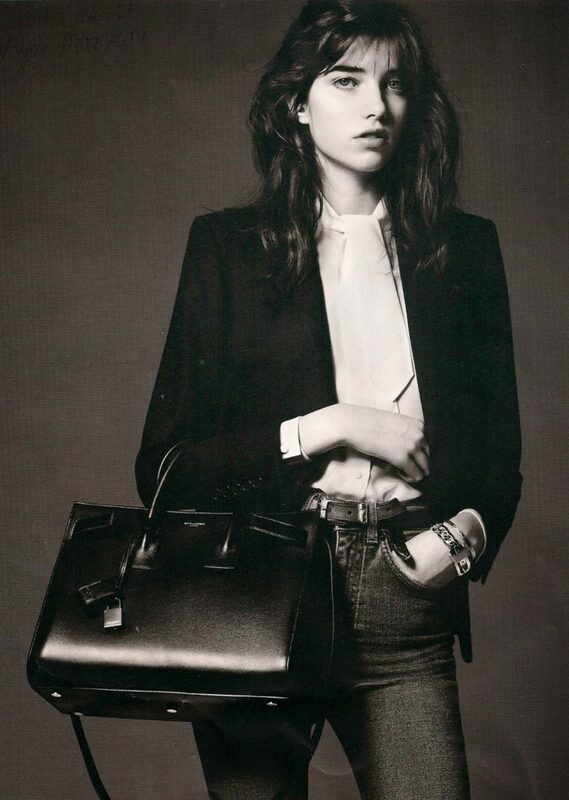 The shot below is from the May issue of Harper’s Bazaar. Not sure if I’m loving this look, though. 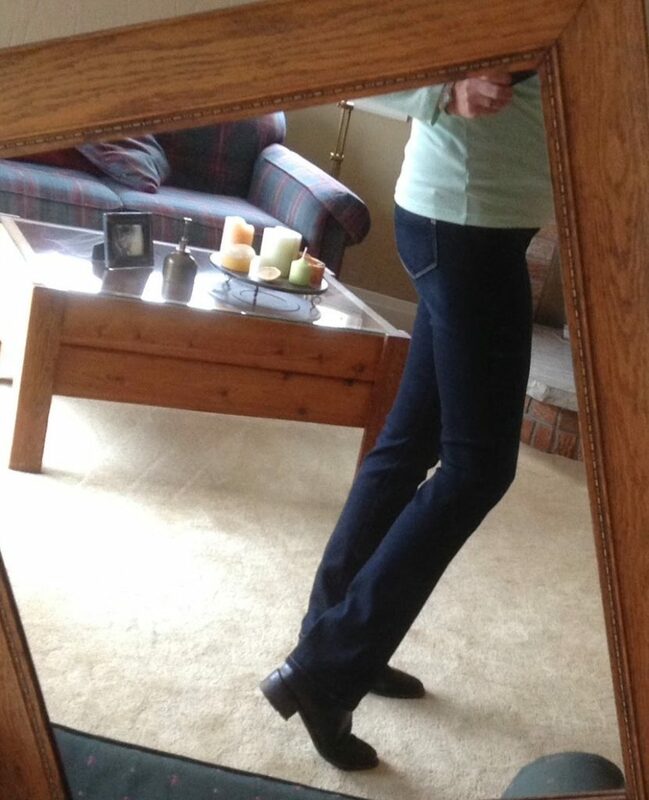 And pants are not only flaring out, they’re coming back up in the waist…thank goodness! But I love my skinny jeans! Especially with boots or rolled up with loafers and flat sandals! Maybe a compromise? I’m sold now. I love these jeans. They’re comfortable, no stopping to hike up my pants all the time. Love the width of leg, sooo great with boots! 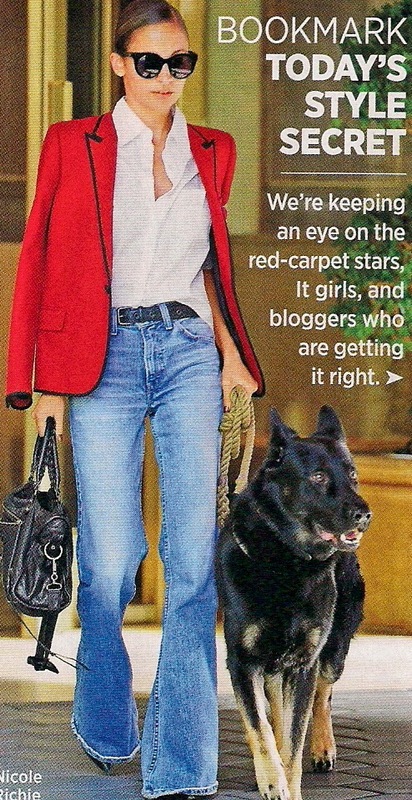 I’ll still wear my J brand skinnies with my long tops and flats….but well, they’re not the only game in town anymore! The high waist and flared leg looks great with a more tailored jacket…which I love…and gulp…say it isn’t so… a tucked in shirt. Oh dear, not sure I can go there. However, the jacket I CAN do…have been doing, in fact. Boots, jeans, and tailored jacket has been my “uniform” for years. 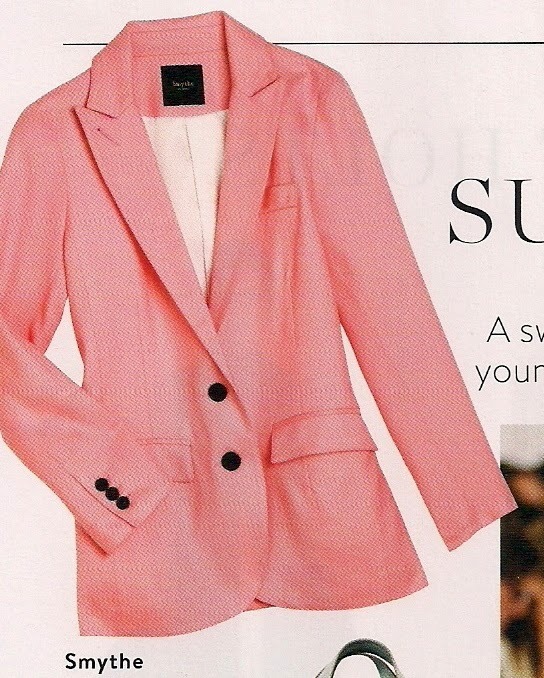 The jacket featured in the lay-out from the Holt Renfrew Spring 2014 magazine below is a Smythe jacket. A brand worn and loved by Kate Middleton and … by moi! I have almost the exact same Smythe jacket from 2009! But mine is blue, not pink. I haven’t worn it in a couple of years. 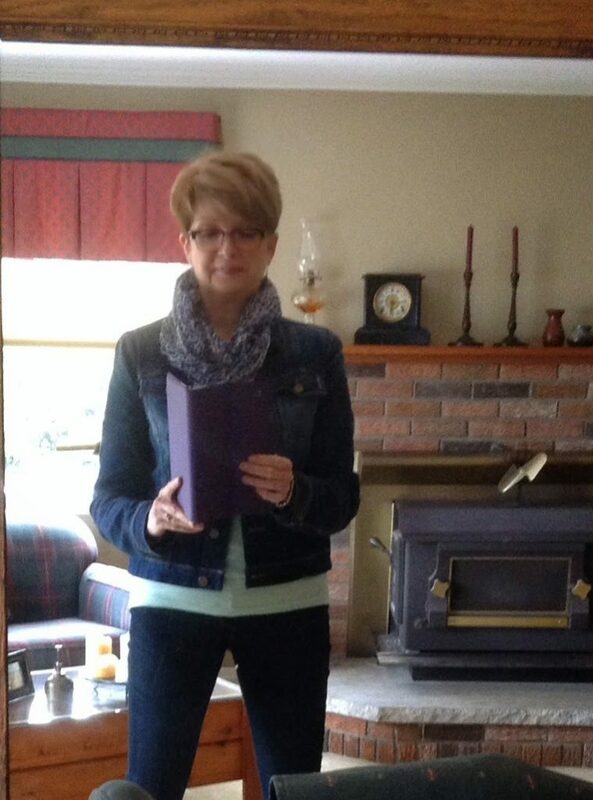 So I haul it out of the closet …and… I really like it with my new Paige jeans and my $12.00 Gap pastel, green tee shirt. Oh and the blue scarf…which I never noticed goes perfectly with the jacket. So…I’ve climbed on the bandwagon with a couple of trends. And just shopped my own closet for the third. But that tucked in waist? No, no, no, no. Tried it. Hated it. Won’t be going there anytime soon. This is what I eventually wore out to lunch last week. Swapped my Smythe blazer for this Paige jean jacket (from last year.) I can throw my raincoat over the jean jacket more easily. Still loving that sea green shirt! And very excited about finding something I can wear those green earrings with! I know I just ended that last sentence with a preposition. And for English teachers (retired or otherwise) that’s a no-no. But it’s not every day that a girl jumps on a bandwagon. Especially one that she vowed never to jump on. See… there I go again! I must be REALLY excited! Have you climbed on any spring trend band wagons lately? I really like how you've made the trends work for your best look, Susan. I think your straight jeans look fantastic. Thanks for sharing with Visible Monday, welcome to the group! And please come again. You look absolutely great in the "new" trends 🙂 That color is really pretty on you, and I like the cut of the jeans. Thanks very much Lana. It sure was a surprise that I liked pastel green! I love your jeans on you!! Which style of Paige jeans are yours? Thanks. They're called Paige "Hidden Hills Straight." They are nice and high in the waist an have just the right amount of stretch too! I love them. You look great and really know how to pull it all together!! I am not really able to wear pastels, I need some color saturation going on in even the lighter shades! Thanks for the lovely compliment, Karena. I do wonder if I will like my pastel shirt without the scarf. 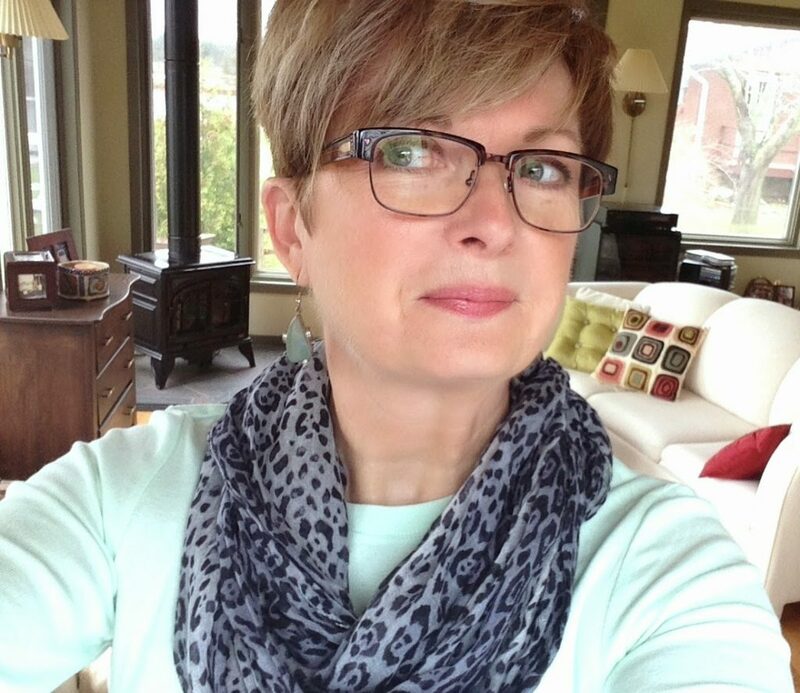 You look great in your jackets and scarves…hope you are reading over50feeling40 as well! Thanks for linking up with our Thursday Blog Hop!! Thanks, Pam. Reading your blog every day…it's bookmarked on my i-pad mini! So nice to meet you, Susan! It's perfectly okay to end your sentences with a preposition. Especially when you know when you're doing it! There's so much free-floating angst about "trends." Good never to jump on the latest thing whether it suits me or not, but I love the idea of trying new shapes and silhouettes. And breaking an old hide-bound rule or two if it means looking like I pay at least a little attention to current ideas. After all, a trend is just an idea that lots of people are trying. They might not be great ideas all, but some might make for a wardrobe- refreshing change. Looks like your instincts about all this are serving you well! Thanks, Jan. I agree with your sentiments about trends. I also like to "pay attention" and then see how new trends can work with what I already know works best for me. Some are definitely a no go area! Short hair can be a problem, as far as I am concerned, if you don't have a great hair stylist. One who understands that women over 40 (or over 50, in my case) want a look that is a little edgy. I live in fear of my hairdresser retiring or moving away! Thanks Katherine. Thanks for making the Blog Hop happen!